One of the most under-rated artists in Haiti is Francoise Eliassaint. Yet, for those who adore her distinctive imagery and style in paintings, she has few, if any, peers — male or female. The only artist I can think of to whom she can be rightly compared is Saincilus Ismael, because both display a profound fondness for religious subjects. Born in Puerto Principe in 1962, Eliassaint caught the painting bug by virtue of observation. She was the girlfriend, then the wife, of well-known artist Andre Normil, who worked in a studio one floor below the gallery of Issa el-Saieh in Port-au-Prince. Then she turned to her own canvases, methodically painting at a slow pace. Her subjects included scenes of daily life and Haitian revolutionary heroes. But it was the religious paintings that caught the eye of collectors. Just try to find the paintings of this female artist online. They are few and far between. According to el-Saieh, she created just one painting in six weeks. During one of my visits to Haiti, he bragged about having no Eliassaints available for sale and commissions with galleries on other Caribbean islands waiting to be fulfilled. But subsequent trips to Haiti brought success for me in buying the artist’s remarkable work, which gave me opportunities to live with her paintings, study, and appreciate them. I gravitate to the religious/spiritual works, usually of the Virgin Mary or the Haitian spirit Erzulie — a heady mixture of Roman Catholicism and Haitian Vodou. One of my personal favorites is “Erzulie Danthor and Child” (1988), on page 62 of my book “Masterpieces of Haitian Art.” The governess of love is in a blue headdress with a crown, on top of which is a Christian cross. Balanced on her left arm is a girl child of age five in an orange dress with white lace embellishments at the neck, wrists, and hem. These two figures are encased in an oval frame, surrounded by a square with pink flowers, and a second border of a flowering green vine. Reminiscent of Russian icons in silver and gold, the painting projects an air of unintimidating majesty. Within her impressive body of work, there have been departures from the religious imagery. “The Coffee Drinkers” (1989) shows a family brewing coffee at a fire, outside their humble home. When I hung the painting in my living room, my Haitian next-door neighbor said it reminded her of her childhood in Haiti. In another case, Eliassaint made a stab at the Saint Soleil style, using an amoebic proto-human as the main subject, surrounded by gaily colored criss-cross marks and other decorative flourishes. 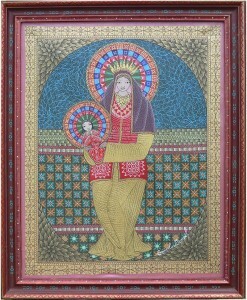 “Maternal Figure” (1989) may have been her only foray into this sub-genre of Haitian art, which she accomplished with a psychic connection to the imagery of Saint Soleil’s only female artist, Louisiane Saint Fleurant. A heart adorns the body of the main subject — it is the symbol of Erzulie. The two pink fish at her feet evoke a connection to La Sirene, who is the cousin of Erzulie. The paintings of Francoise Eliassaint manage to be beautiful without being sentimental or overdone. Her figures radiate a purity of heart and religious fervor. One can see that these works come from the hand of a woman sustained by faith, just like the Haitian people. You won’t see many of them on the streets in Port-au-Prince or Jacmel when you visit Haiti. But cats play a significant role in Haitian art. Domesticated felines, along with their symbolic implications, take front and center in the work of some artists. Yet, in other paintings, like the work of S.E. Bottex, cats are just part of the scenery, whether the image is of Jesus Christ at the last supper or people holding fish at a dock. Jean-Claude Paul is perhaps the best-known artist for doing variations on the cat theme. His 20-inch by 24-inch paintings of cats, usually all in the same color (either white or black), stand tall and fill the frame like proud chorus girls. Paul’s felines dominate nature – they are the biggest element in his outdoor scenes, just like Haiti itself plays a larger role in the world than its size would suggest. Cats rule on Paul’s canvases. Mother cats with the babies lined upon her back like alert sentinels are another favorite subject of Jean-Claude Paul on canvas. 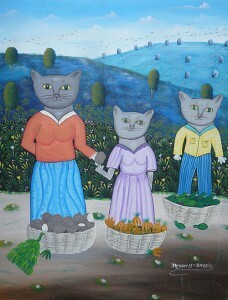 Since women run the households in Haiti, these cat families can be seen as examples of domestic order. Cats are considered a sign of good luck in Haiti. They are the representations of bliss at home, where the owners have enough money to feed them and tend to their other needs of shelter and affection. But cats in Haitian homes also serve a function, catching snakes and mice that dare to enter by the front door or a half-open window. Just like Jasmin Joseph, whose anthropomorphic animals take on human attributes, the cats in the paintings of Jean-Veny Brezil enact the roles of mortals. They even wear clothes. And they work, carrying and selling the fruits and vegetables in their baskets. Brezil’s groupings are particular. He uses a domestic trio of a mother cat and her boy cat and girl cat children. There is a plaintiveness in their faces that balances the sweetness of his paintings. While these paintings would fit in a children’s book, they are sophisticated enough to stand on their own in the home of anyone who loves Haitian art. Artists working in other media in Haitian art have also found felines to be inspiration. An unknown artist created the oversized gray-and-white “Cat Face” in papier-mache that hangs in my bedroom. With big cheeks and a serious expression, this kitty looks ready to rumble, as male cats are wont to do. He symbolizes the strength of intended aggressive action, much like the Haitian Vodou (voodoo) spirit Ogou Feraille associated with war and metallurgy. Cats have also made their way into the realm of Haitian metal oil drum art. I commissioned a work of cats in a tree and the result was beyond great. This painted metal sculpture features four nearly identical yellow cats with orange stripes, standing on the branches of a tree. Their noses are shaped like hearts. Another outstanding metal piece in unpainted metal portrays a large cat looking up at a small tree. These two wonderful artworks are by unknown artists. Of course, cats are genetically related to large jungle animals like lions, tigers, and panthers. We’ll save the prominent role of big cats in Haitian art for another day. Who doesn’t appreciate the beauty of a landscape painting? This genre within Haitian art attracts people of all ages, even young children, to depictions of the real world and imaginative re-interpretations of the sea, mountains, streams and fields. In fact, landscape painting goes beyond borders, attracting people in other countries to these often other-worldly snapshots of the island country. These works have staying power and a wider audience than other genres, like the modern abstracts. Sometimes, landscape paintings are symphonies of color and mood, like Jean E. Cadet’s “Dreamscape” — a misty re-creation of fields suffused in soothing shades of green and blue. It is a triumph of subtle color manipulation. A painting of a waterfall with wading birds in the rain forest is typical of the Zen-like works by H.R. Bresil. He was an artist sought after by Japanese collectors in the early 1990s, when he travelled to Japan as a special guest and even made a label for a Japanese wine. With Bresil’s passing, there are low-cost imitators of his style and peaceful imagery. While these artists may not have his felicitous touch, they continue a tradition that is popular with collectors. “River Scene” by J.A. Bernang is another twist on the landscape. It depicts women washing clothes in the river in the foreground. But the dominant element is the field in the background, through which the river runs. Looked at from afar, that field looks like the sea. Other paintings in this genre are the product of creative genius in manipulating reality. No one does this better than Prefete Duffaut. His architectural masterpieces on canvas convey the topography of Haiti (the original name of Haiti is Ayiti, meaning land of high mountains). Duffaut is known for piling mountain on top of mountain, where human activity is bustling. But the artist doesn’t stop there. He includes a pantheon of Vodou (voodoo) spirits and ceremonial staples. In “Visions of Ezekiel,” measuring 40 inches by 30 inches, mermaids or versions of La Sirene swim in pools of water, near the drums essential to Vodou ceremonies. Duffaut not only elevates the fantasy landscape genre, he turns it inside out with embellishments that incorporate the religion of Haiti. Another exponent of the genre is Mario Montilus, whose small paintings I discovered at Galerie Issa in Port-au-Prince in the 1980s. The artist wields paintbrushes with tiny bristles, achieving exquisite details. “Wedding” (1994), measuring eight inches by ten inches, features a bride and groom on a mound in the sky, like lovers carried high on the wings of their happy emotions. In “Mystical Islands” (1989), the same size, the flowering islands look as soft as pillows floating in a placid sea. Joel Lucien is also a painter of fantasy landscapes, but his are even smaller than those of Montilus. Some are only five inches by fives inches on masonite. But their small size proves no deterrent to his creativity. Lucien’s paintings picture flowering islands in blues and greens, floating in space or heaven, sometimes with people in the verdant mix. These idealized visions may owe a partial debt to places that artists in Haiti have actually seen. Anyone who has driven high up in the mountains of Haiti knows how awe-inspiring the views are. From that perspective, maybe adjoining small islands do look as pristine and untouched as the artists make them seem. It is curious how some paintings have the power to grow on you. At first, you may not appreciate their virtues. But, in living with an artwork about which you initially felt indifference or even contempt, familiarity breeds awareness, followed by fondness. This process occurred for me after buying a painting by Gerard Paul in the 1980s. It portrayed a man becoming a woman, a confused gender portrayal that left me baffled. The background was a mixture of colors, a quasi-psychedelic melange, created as if in a drug-induced state. Yet there was a precision about it in line and form that revealed no mental impairment on the part of its maker. The artist knew exactly what he was doing. Why did I buy the Gerard Paul painting that I didn’t like? My boyfriend talked me into it. He was an artist with sophisticated taste who lobbied hard for me to purchase the painting. And so I did, hanging it on the living room wall with reluctance. Over the years, I began to appreciate the sense of humor in the painting. In early November during Vodou (voodoo) ceremonies for the Guede spirits in charge of death, gender-switching is normal. This acting out in unaccustomed ways equates to Halloween, when assuming another identity is fun for one night of the year. Eventually, I fell in love with painting “Transformation” by Gerard Paul, which I am glad to say I still own. Having seen many more paintings by the artist since the mid-1980s, I can say I never saw another one like it. My infatuation with the paintings of the late Saincilus Ismael was also slow in coming. While I owned the Biblically inspired works of this artist, I never drew spiritual sustenance from them, as I did from so many other artworks. Then I bought a Saincilus Ismael painting and hung it in my bedroom. It is typical of his ouevre, featuring a Madonna figure in long robes holding twin girls — the Marassa. They are the mischievous yet divine children of God. Discovering another Ismael painting last December, I was smitten by its color, patterning, and even its imperfections, like the uneven line that forms the outer border framing the subjects. Since the painting just arrived at my home, I am thrilled. I can’t stop studying the minuteness of careful brush strokes in the background of “Madonna in Gold,” an oil on canvas measuring 20 inches y 16 inches, with a hand-painted frame by Robert La Fleur. Gold positively radiates from this magnificent painting. Both mother and baby wear identical halos that resemble sunbursts. These stately headpieces are multi-colored in shades of green, red, blue and purple, then orange; each color has straight or squiggly lines or designs. The Madonna wears a gold crown over the long brown head covering that drapes from her shoulders to upper arms. 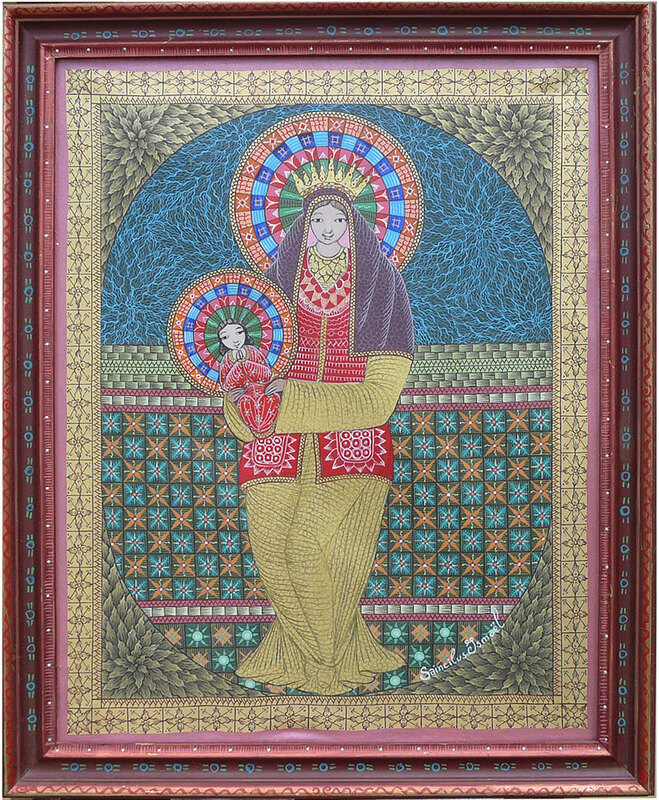 Like Gerard Valcin, a Haitian painter who was a tile setter before turning to art, Ismael pays attention to details, like the pattern on the floor and wall behind the Madonna. Starbursts in green and orange adorn these surfaces with manufactured-looking perfection. Yet these surfaces do not detract from the subjects, but serve to enhance them. With his paintings resembling Russian icons, but with a decidedly Haitian flair, Ismael has imitators in his wake who carry on his imagery. But there is detectable difference in his paintings. Study enough of them up close and you’ll know what I mean. Not just limited to Biblical themes, Ismael is also known for scenes of revelers — musicians playing instruments and people dancing, all enjoying the excitement of sound and movement. Obviously, these works convey a gaiety that the serene Biblical works do not. The artist speaks to a range of moods. Saincilus Ismael was born in Petite Riviere de l’Artibonite. He began to paint in 1958, after visiting the Centre d’Art in Port-au-Prince. His work bears the influence of Byzantine art he saw in books. He became director of the ceramics center in Deschapelles. Painters Michel-Ange Altidort and Carlo Jean Baptiste were among his students. Ismael died in 2000. While his paintings are prized, they have gone unnoticed by some prominent authors. There is nary a mention of Ismael in Selden Rodman’s seminal book “Where Art is Joy: Haitian Art, The First Forty Years” (1988). Nor is he present in “Haitian Art: The Legend and Legacy of the Naive Tradition” (1985) by L.G. Hoffman. Ismael is in my book “Masterpieces of Haitian Art” (2013) and his works are coveted by the cognoscenti, only in part because there are so few in circulation. Only Andre Pierre presented his religious subjects in similarly regal fashion. They are Godly personages from a world of faith that has sustained the Haitian population through poverty, political upheaval, floods and earthquakes. If the Vatican in Rome, Italy ever establishes a gallery of global Christian art, the paintings of Saincilus Ismael would fit right in, representing Haitian visual expression at its best.